The Hotchkiss Revolving Cannon was built in four calibres, but all used the same mechanism, so for the purposes of this web presentation I will describe the naval version of 37 mm calibre. Much of the text has been taken from documents published between 1874 and 1885 (see references). Inevitably these texts extoll the benefits of the Hotchkiss in comparison with the competitors. On this page I have included a Quicktime movie to show how the Revolving Cannon works, together with images from the movie and text describing the mechanisms. 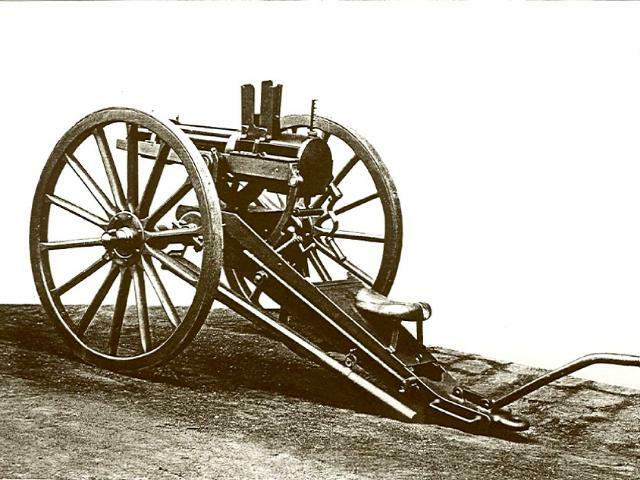 The Hotchkiss revolving cannon consists of five barrels, mounted parallel to each other, around a common axis, and carried between two gun-metal disks, as in the Gatling gun. This group of barrels, bearing at their front end in a gun-metal frame carrying the trunnions, is rotated in front of a fixed breech-block, which contains the mechanism for loading, firing and extracting the spent cartridges. There is only one set of mechanism for all the barrels, each barrel being brought successively before the loader, striker and extractor. The barrels do not rotate continuously as in the Gatling gun, but make only one-fifth a turn at a time, thus bringing, at each movement, the following barrel into the place occupied by the one before it. The continuous turning of the hand crank imparts this intermittent rotary motion to the barrels, and they are at rest during the period of loading, firing and extraction. In this manner each turn of the hand-crank loads one barrel, fires another, whilst the spent cartridge is being extracted from a third. 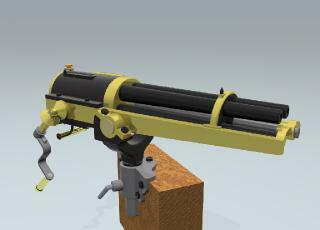 This arrangement gives a very simple mechanism, consisting of only few parts, and these can be made large and strong, and, therefore, makes this gun better able to support the rough usage of regular service than other machine-guns which have an independent set of mechanism for each barrel, which, of course, multiplies the number of parts and requires them to be made smaller and lighter. 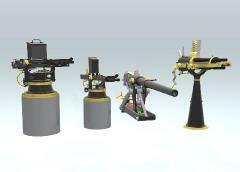 Ammunition is supplied in a hopper containing up to 10 cartridges. To regulate the supply of cartridges, there is an arrangement called the feed gate, so that only one cartridge can enter the receiver at a time. The rest, which are piled one upon another in the hopper, are cut off whilst the bottom one is pushed into the barrel. A cartridge is placed in the hopper, when the loading piston is fully retracted, the feed gate descends and allows it to enter the receiver in which the loading piston moves. The piston then pushes it into the barrel, but not fully home. As the barrel assembly rotates, the cartridge is gently pushed forward by an inclined plane cast in the front of the breech, so that it is fully home when the barrel reaches its lowest position in front of the striker, and the base of the cartridge rests against the solid part of the breech; here the breech is perforated by a hole for the point of the striker to work through. Of course this, like other machine-guns, uses a complete cartridge holding in each the projectile, the charge and the primer. 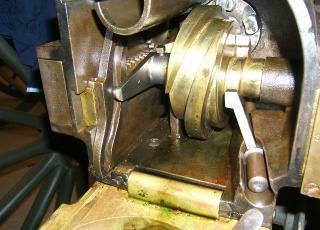 The gas-tight closure at the breech is effected by the metallic cartridge. It will be seen how absolutely secure this arrangement of the gun is, and this is for machine-guns of large calibres a very important feature, for the continuous shock of discharge acting against any kind of lock, or bolt, or other mechanical breech-closing arrangement, is sure, sooner or later, to cause the breakage of some parts of the mechanism. As to the manner in which the loading and extraction of the spent cartridges is performed we must refer to the animation. There is a fixed cog-wheel (red), mounted on the interior face of the left side of the breech, and two horizontal racks running in slides. The rack which is attached to the loading-piston is placed above; the other, carrying the extractor, under the cog-wheel and parallel to the axis of the barrels, so that in moving one of the racks, the other one is moved by the cog-wheel in the opposite direction. Part of the lower rack forms a curved link, or yoke (shown in blue), in which a small crank works; this crank being fixed on the shaft which carries the worm and is turned by means of the hand-crank operating the whole mechanism. The rotation of this small crank imparts an alternating and opposite movement to the two racks, so that while the one is going forward, the other moves back, and reciprocally. A spent cartridge case is in this manner extracted, whilst a loaded cartridge is being introduced into the barrel above. The extractor itself consists of a double hook at the front end of the lower rack. The head of the cartridge rolls into this double hook as the barrels are turned round, and it is so laid hold of, and withdrawn from the chamber as the rack runs backwards; besides this there is an ejector to push the cartridge out of the extractor hooks at the proper time, and it falls out of the gun through an opening in the under part of the breech. The nature of the material for the different parts of the gun was chosen after the results of long experiments. Whitworth’s steel is exclusively employed for the barrels. Gun-metal is used for all parts of the mechanism which are subject to sliding motion, so that it is impossible for anything to rust together if neglected and not oiled, then gun-metal is always used for the frame, disks, and some other parts, and in the naval guns for the pivots, etc.., as it has the advantage of not rusting, which is important for sea service. The intermittent rotary motion of the barrels is effected simply by a worm, of which the thread is partially straight and partially helical, this worm gears in a pin-wheel, on the rear end of the central shaft. 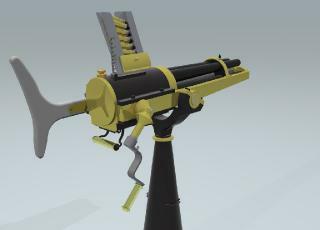 The worm carries at the same time the cocking-cam, which retracts the striker and allows it to fly forward at the proper moment by the action of the firing-spring. This spring is the only one in the gun, all the other operations are done by positive action. "The gun is usually mounted on a universal pivot, so it can be laid and fired by a single man, whilst another supplies it with ammunition. It has been found absolutely necessary, after experiments at sea, that the same man should lay and fire the gun; because the vessel itself is moving, and then the torpedo-boat or other object, which may be advancing very rapidly and continually changing its course and position, would easily avoid the fire of the vessel’s guns, unless it were possible to keep them continually sighted on it, and to fire at the actual moment the sight is brought to bear on the boat. All this has been made possible with the revolving cannon. Each turn of the crank corresponds to a shot; the gunner with the shoulder piece to his shoulder, and with his left hand holding the directing handle under the breech, lays the gun after he has turned the hand-crank so far that it comes just before the firing position, which is indicated by an arrow on the crank; but besides this, the man, by putting out his thumb, can stop the crank without having to look at its position at all; he then lays the gun, and fires it by turning the crank. The motion of turning the crank to fire the gun prepares another round, and he is again ready to relay the gun a second time, and so forth; so you see it is like a little cannon, in which the whole process of sponging, loading, running out, etc.. has been entirely done away with; the gun is always ready to fire, no matter with what rapidity the gunner can manage to lay it. At sea, it is generally intended that this gun shall be laid for each round, and the sighting corrected by observing the bursting of the previous shot fired, and not to "blaze away" ammunition at random, as is usually the case with mitrailleuse guns. The sight which is employed at sea has fixed notches, corresponding to the distances from 200 to 2,000 metres or yards, as the case may be, so that as the distances change, the gunner may fall from one notch to another without any loss of time for setting the sight. For instance, in the case of beating off a torpedo-boat attack, if the boats were discovered sufficiently soon, fire would be opened at about 1,500 to 2,000 yards; then the fire would be slow, as it would take about 5 seconds before the projectile can strike. As the boat advances at full speed, the fire will be increased in rapidity, so that should one or other boat succeed in getting up to within perhaps 500 yards, the rapidity would be 25 to 30 rounds per minute; and at close quarters, when sighting is not needed each time, 10 rounds (which can always be kept in the gun) can be fired at the rate of 60 to 80 per minute. The whole system of the extraction works very positively, and it works equally well at the highest elevation as at the greatest depression, which is 30 degrees. This extreme angle of depression is sometimes required when the gun is used from the tops, or from the bridge of vessels high out of the water. Characteristics of the Hotchkiss Mechanism. 1st. Intermittent rotation of the barrels, without rotation of the breech or mechanism. 2nd. The barrels remain stationary at the moment of discharge, the loading and extraction taking place during this stop, suppressing any chance of accident from a "hang-fire" cartridge, as the barrels remain relatively a long time in their firing position. 3rd. The employment of but one loading-piston, one striker with its spring, and one extractor for all the barrels, thus giving great simplicity to the mechanism, and allowing at the same time all parts to be made sufficiently strong and heavy to sustain the rough usage of actual service. 4th. The shock of discharge is received against a massive fixed breech of considerable weight, which distributes it to the whole system; this permits the employment of charges and projectiles only limited by the weight and dimensions thought proper for the gun and carriage, so as to suit the different requirements of the Service for which it is to be employed. 5th. The mechanism of the gun is disposed in such a manner that no tools are necessary for dismounting or re-assembling the same, and it can be done in a couple of minutes by any ordinary armourer.